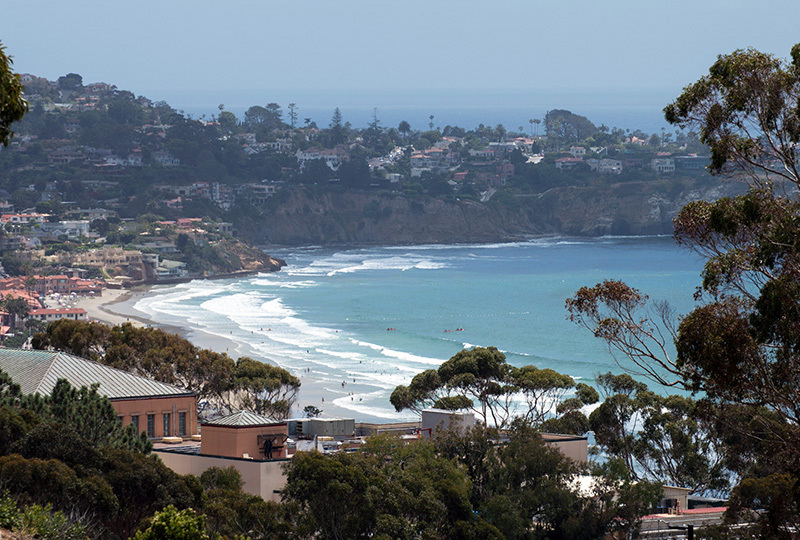 I was sent a link on a few unique and hidden spots to visit in San Diego so, on my way to Coronado, I decided that I would see if I could do at least 3 on the list of 15. 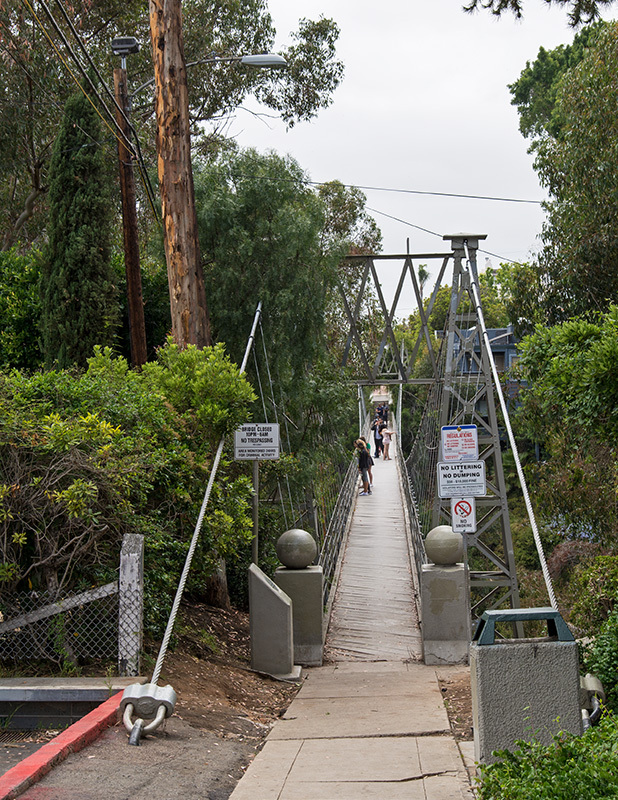 The first two on the list were “The Secret Swings of La Jolla” and the “Spruce Street Suspension Bridge” both of which we decided to check out and the third would be determined later. 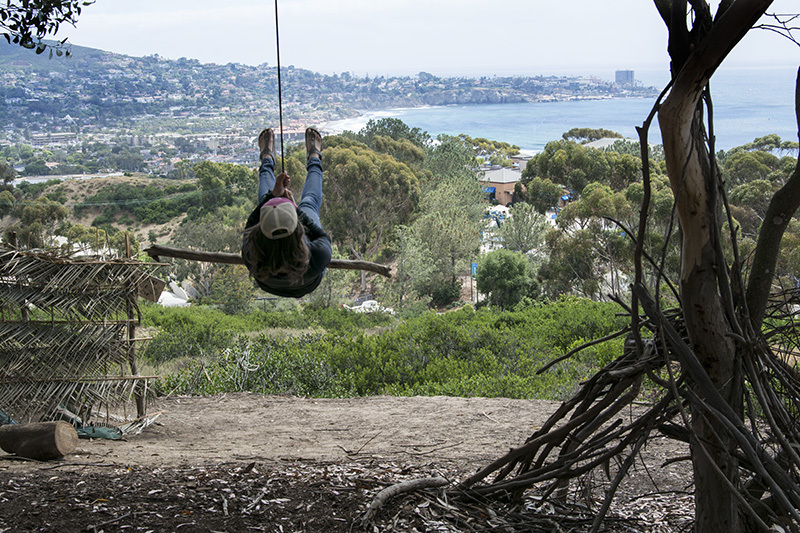 Our first stop was the secret swings located on the bluffs in La Jolla. I spoke with one of the locals and was informed that a few of the swings had been torn down by the city for safety reasons so I didn’t see the amount of swings described in the article from the link I received. I saw one. Granted I didn’t hike too far in the area so there could have been more hidden here and there. The person I spoke with even said that there could be more but he wasn’t sure either. So if you feel like exploring a little more deeply than we did, you may be rewarded by seeing an additional swing or two. The one swing we did see was basically a large tree branch attached to a rope and then to the tree. There were a couple of people swinging on it when we arrived and they only stopped long enough to snap a few photos. We called them the swing hogs because they never did relinquish it for us to give it a try. 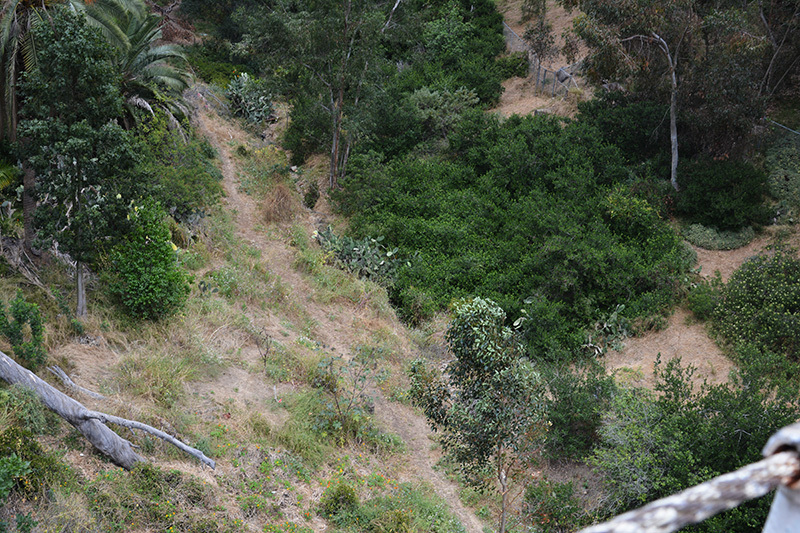 Even without swinging, the view was spectacular from this bluff and was well worth the few feet to hike in from the street. We entered through the Discovery Road site but I hear there are other ways to get in. There were little handmade huts made from tree branches that we were also told were used by the college kids as a hang-out. One had a hand written sign that read “Keep Out.” I peaked in because I didn’t see the “Tree Swing” police anywhere around but here was nothing to see anyway. This secret spot (or semi-secret) didn’t have that whimsical feel to it that I had hoped. 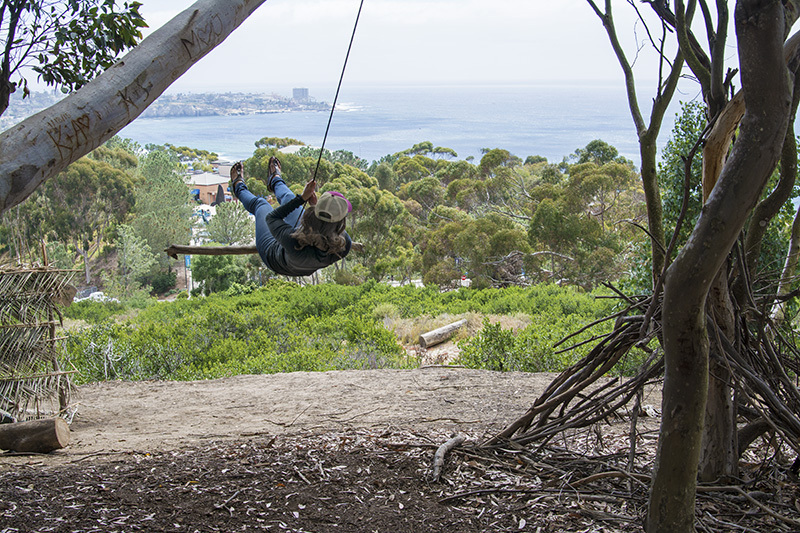 I imagined swinging along with the magnificent view of the Pacific Ocean in the distance and a warm gentle breeze flowing through my hair. Somehow I even imagined wind chimes and Tibetan singing bowls howling in the wind. I think I daydream way too much. What I got was swing hogs, keep out signs, and a biting cold breeze howling off of the ocean. Plus I don’t think that thick tree branch would be too comfortable to swing on anyway. Nearby, a couple of people set up their own hammocks on the trees and they looked quite content swaying in the breeze. Those hammocks looked way more inviting than sitting on that uncomfortable branch they called a swing. What WAS worth it all…that view. The sun was just peeking out from the gray drab cloudy day and its rays hit the blue water making it look as vibrant as any tropical location. 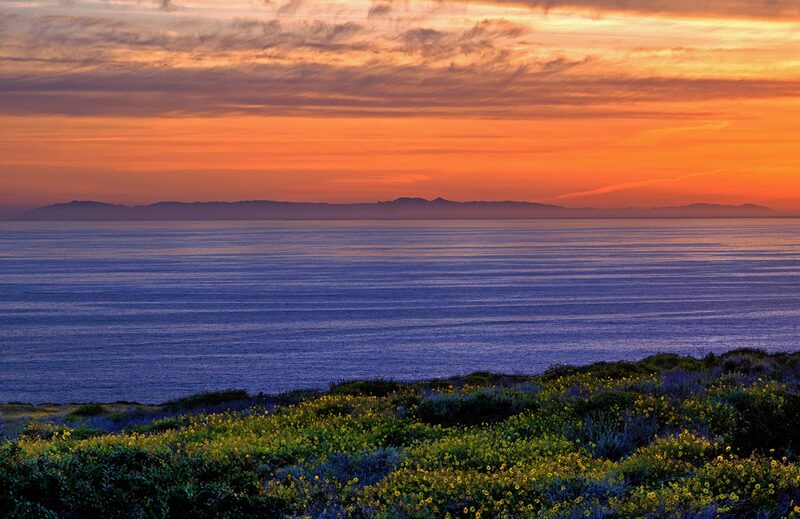 It was a spectacular 180 degree view of La Jolla and beyond. So the question remains, are there more swings? I don’t know the answer but, if you are so inclined, it is all there for you to discover. A few miles down the road we traveled to the San Diego Airport area off of Laurel St exit. You just travel a few blocks to 1st Street and then find the smallish Spruce Street. The bridge is right there so you can’t miss the entrance. Being the weekend, this hidden gem wasn’t so hidden as there were about twenty other people walking back and forth across the bridge. I am sure at one time it truly was a local’s only spot but more and more people are hearing about it and want to take a look for themselves. 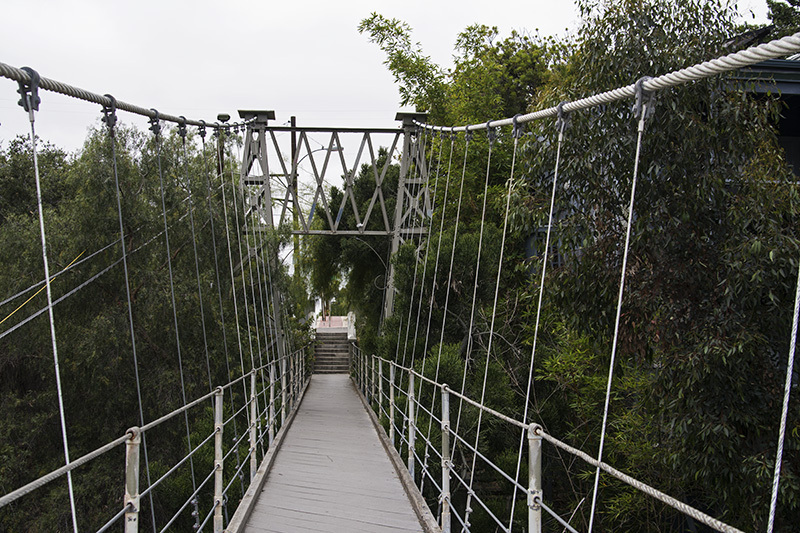 I don’t think I ever walked across a suspension bridge other than at an amusement park when I was a kid. It felt a little funny at first, I mean bridges aren’t supposed to move when you walk. This one does. It moves when people walk across and it sways in the wind. I was taking some photos when it really started shaking and I thought a huge gust of wind came by but I looked up and it was just Staycationer JoJo deliberately making it rock back and forth. A few people behind her either smiled or gave her a dirty look. 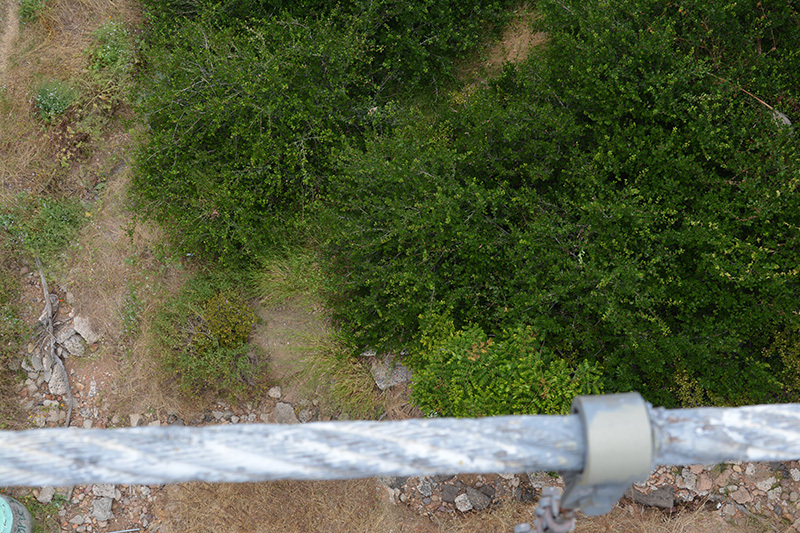 For me it was actually fun hanging over this ravine on a suspension bridge. Now ask me if I would have felt the same if we were thousands of feet over a canyon instead of the 75 feet distance of this bridge. At 375 feet in length it was longer than I expected. In fact, I had no idea what to expect, so I pictured a narrow wooden bridge with beat up planks exposing holes, gaps and weathered rope. I imagined something like out of an Indiana Jones movie. 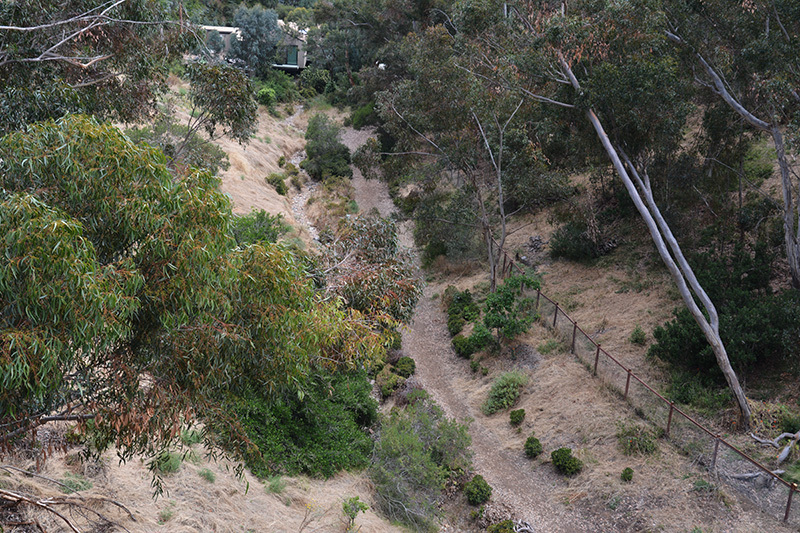 In reality, it was actually wide enough for people to walk side by side plus all planks and ropes were safe and sound. 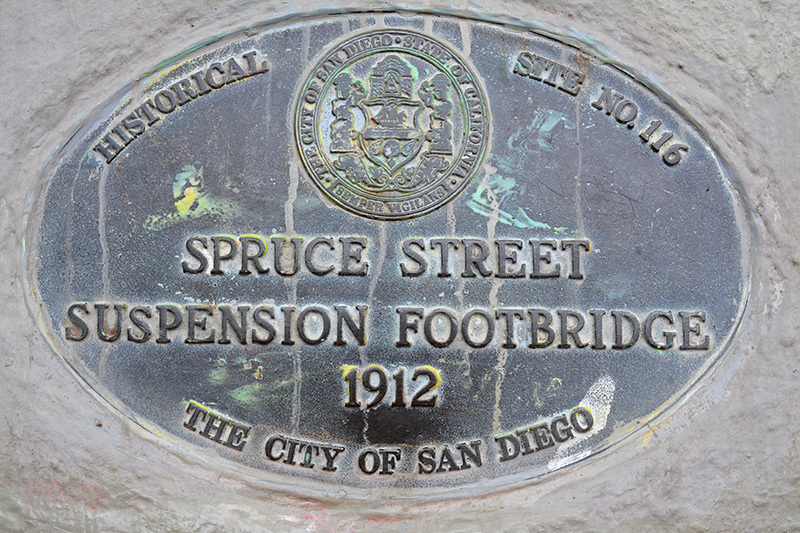 The Spruce Street Suspension Bridge was built in 1912 by the City of San Diego and even though it is over 100 years old, it is inspected and maintained regularly making it extremely safe. 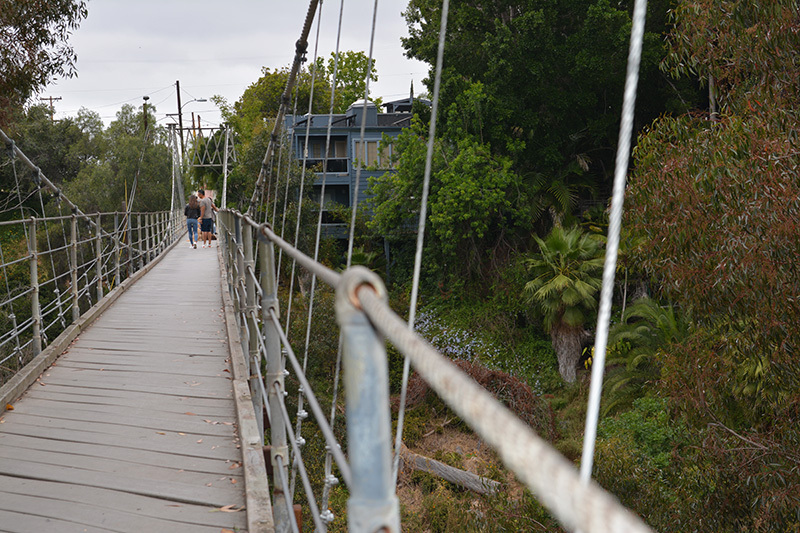 It was originally built as a pedestrian byway for the local neighborhoods to have access to nearby trolley stops. Today it sits as an interesting place to see and experience for locals as well as tourists who know about its location. Judging by the people walking across, it is getting more and more well known. I found it fun and interesting and worth the small excursion from the freeway. It isn’t too high up to make it really scary but I am sure if you are afraid of heights, it may not be for you. We didn’t have time to explore the third spot on the list, so we will have to save that for the next time. 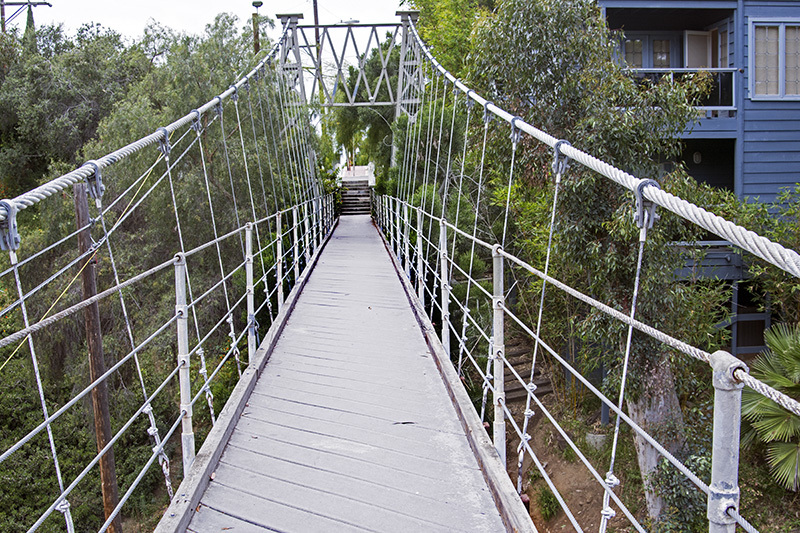 If you have a few extra minutes while you are in San Diego, check out the Spruce Street Suspension Bridge at the location below. I don’t feel bad telling you about it because, even though it is a secret place, the secret is already out! These look very cool. 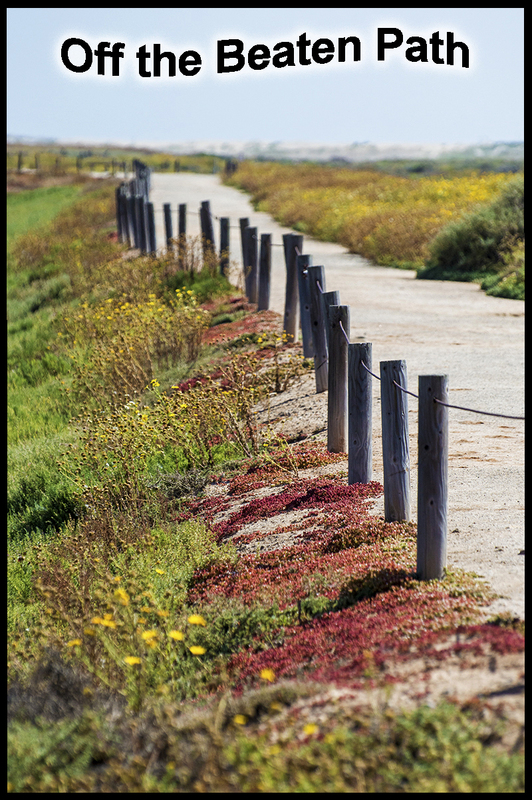 I’m a native San Deegan, now living in Northern California, and I’ve never heard of these places! I hadn’t either until that article. Thanks Terry. 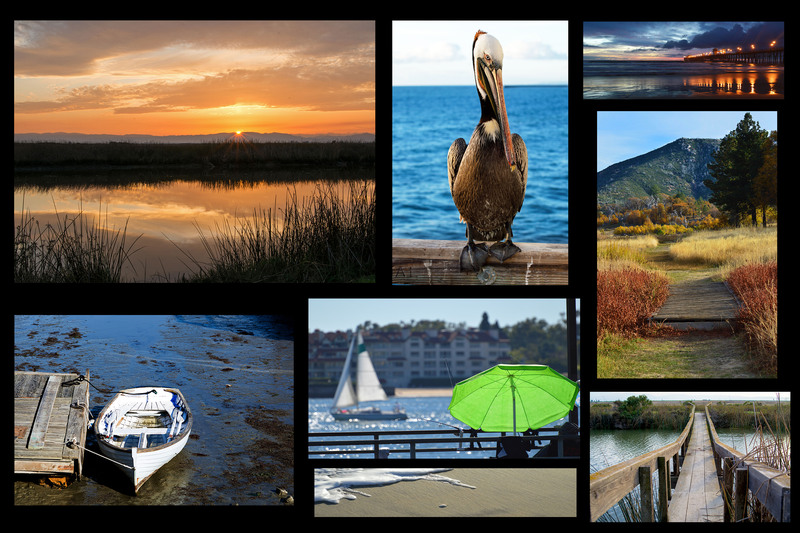 Let me know if you want to guest blog anything from Nor Cal. Thanks, Debbie! I will be in touch! *Diegan* LOL!